After a delay of over a year, Sony has finally rescheduled the cult sci-fi fave 'Gattaca' for Blu-ray release this March. 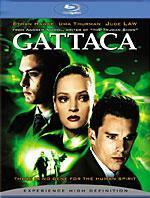 Originally expected to make its high-def debut way back in October 2006, Sony subsequently [post 311] yanked 'Gattaca' from its release schedule without explanation. Now the Ethan Hawke-Uma Thurman starrer finally has a new date, with the studio setting a March 11th bow for the futuristic thriller. Specs remain consistent with the originally-announced Blu-ray, including 1080p/AVC MPEG-4 video and uncompressed PCM 5.1 surround audio. Extras include the original 1997 featurette, deleted scenes, a blooper reel and still galleries. Retail for the Blu-ray is $28.95. You'll find disc details for 'Gattaca' linked from our Blu-ray Release Schedule where it's indexed under its new date of March 11, 2008. We've also set up a dedicated thread for the long-awaited next-gen bow of 'Gattaca' in our Forums area -- click the following link to discuss the 'Gattaca' Blu-ray release.